More than two hundred environmental and health groups, labor unions, asbestos victims’ organizations, and scientists from around the world to urge Prime Minister Harper to support the listing of Chrysotile asbestos on the United Nations Rotterdam Convention’s “prior informed consent” (PIC) list. On June 20, 2011, the 143 countries that have ratified the United Nations Rotterdam Convention will meet in Geneva to once again attempt to add Chrysotile asbestos to the PIC list which requires countries to obtain consent prior to shipping hazardous substances that are on the Rotterdam Convention’s list to another country. Chrysotile asbestos must be added to the “prior informed consent” list to protect public health and dispel asbestos industry propaganda. More than 107,000 people die annually from a preventable asbestos-caused diseases. We urge you to educate yourself and your communities about this lethal fiber, and to share the link below and these recent news articles on your Facebook and Twitter pages. 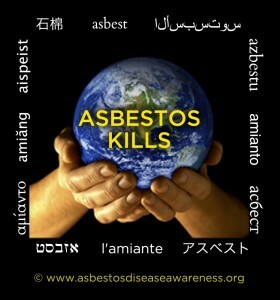 Gazette Quebec Bureau: June 14, 2011, UN body aims to regulate asbestos. This entry was posted in Blog and tagged advocacy, asbestos, Asbestos Awareness Conference, Asbestos Disease Awareness Organization, Canada, cancer, Chrysotile, community, Conference, education, facebook, Linda Reinstein, Lung cancer, mesothelioma, Prime Minster Harper, social media, twitter. Bookmark the permalink.